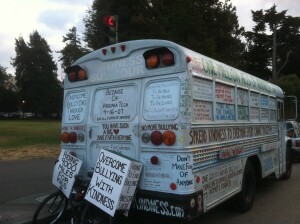 On the corner of the Panhandle in San Francisco, an eight block long park that adjoins Golden Gate Park, bike traffic, foot traffic and vehicles make their way past The Kindness Bus all day long. When I get back from my rides, I like to tether The Kindness Bicycle to the back. As if one of them by themselves isn’t enough of a conversation starter, the two of them certainly is. Because painted buses are somewhat of a common occurrence in this town, especially by the Panhandle, a mere few blocks from the Haight Ashbury neighborhood, having The Kindness Bicycle there, helps define the importance of the mission. This entry was posted on Tuesday, May 7th, 2013 at 6:23 am	and is filed under Kindness. You can follow any responses to this entry through the RSS 2.0 feed. You can leave a response, or trackback from your own site.